The English Department Graduate Program operates in conjunction with the Undergraduate English Programs. The mission of the graduate program is to provide rigorous, advanced-level programs and courses in pedagogy and in literary studies, composition and rhetoric, and language to prepare students for continued graduate study or other professions that require knowledge of language and/or literature and advanced skills in critical thinking, reading and writing. 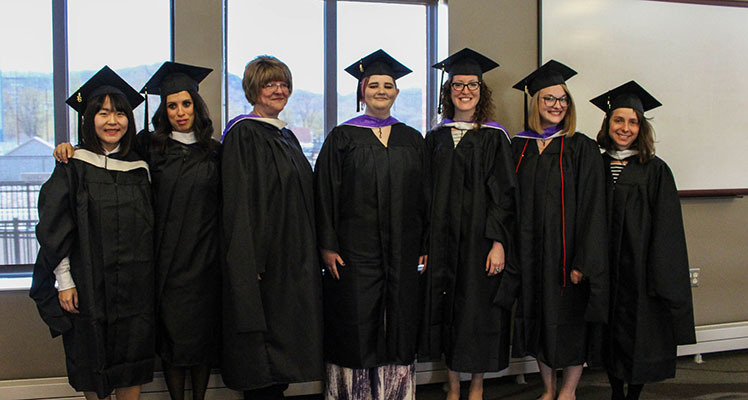 The MA English: Literature and Language Program cultivates advanced-level critical thinking, reading, research and writing skills, and an in-depth knowledge of all major areas of literary studies needed for continued graduate study, teaching at the post-secondary level or work in professional writing. Learn more about the MA English: Literature and Language program. The MS English Program cultivates advanced-level critical thinking, reading, research and writing skills, and an in-depth knowledge of all major areas of literary studies, including the theory and practice of teaching literature and composition. Learn more about the MS English program. The MA English: TESOL Program cultivates an advanced-level understanding of the theories and practices of teaching English as a Second Language to a wide variety of audiences and to prepare students for further graduate study in linguistics. Learn more about the MA English: TESOL program. The Graduate Certificate in Applied and Professional Writing cultivates already strong writing, editing, research and organizational skills for a variety of professional settings. Learn more about the Graduate Certificate in Applied and Professional Writing. The U.S. Department of Education requires colleges and universities that have any financial aid eligible programs that “prepare students for gainful employment in a recognized occupation” to disclose certain information, such as program costs; occupations that the program prepares students to enter; occupational profiles; and the number of students who have completed the program. A Gainful Employment Disclosure for the Graduate Certificate in Applied and Professional Writing is provided.